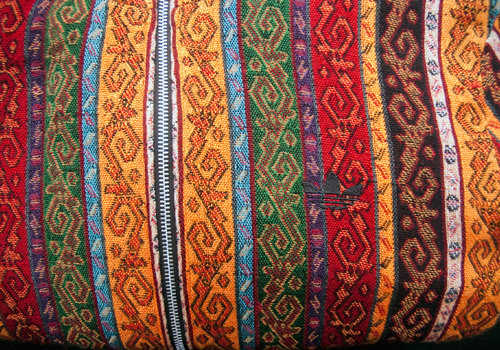 This intricately woven track top was released as a part of the 2006 Materials of the World collection inspired by the colorful and lively bazaars of Turkey. It was made to match a ZX 500 that was also part of the Turkey pack. 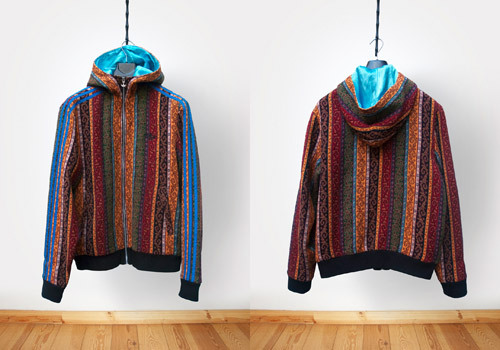 The main feature of this track top is the hand-woven cotton patterns that vertically line the chest, back, and arms, broken only by the royal blue stripes that run along the sleeves. The inner lining of the jacket is a real treat; a silky ice blue polyester layer giving an air of elegance and high class style. A small black trefoil is embroidered on the left breast, matching the black cuffs and waist band. 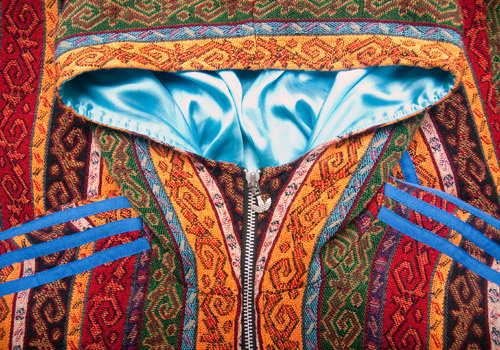 The silver zipper is completed with a small metal trefoil pull tab. Despite it’s delicate and ornate personality the jacket is quite thick and rather warm, though certainly not the right apparel for a rainy day. The hood is well spacious and zipper’s tape end reaches higher than normal, giving nice neck and lower face coverage.